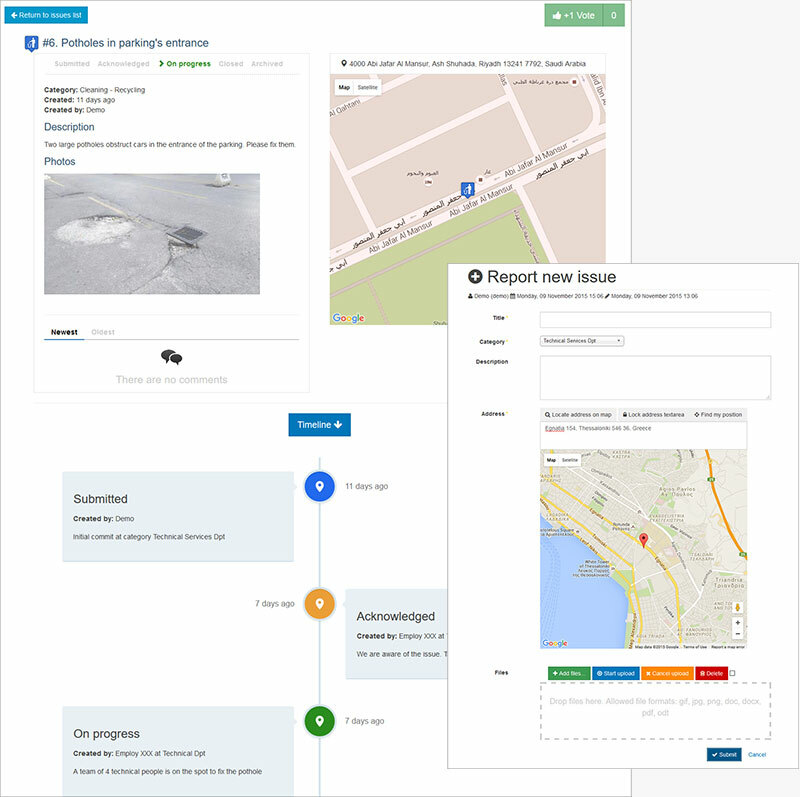 The Improve my City application enables the citizens to report non-emergency local problems such as potholes, illegal trash dumping, faulty street lights, broken tiles on sidewalks, and illegal advertising boards. The submitted issues are displayed on the city’s map. Users may add photos and comments. Moreover, they can suggest solutions for improving the environment of their neighbourhood. Through this service the Municipality enables citizens and local actors to take action to improve their neighbourhood. Citizens can report issues from their home using the web version, or while on the street using the mobile app (iOS & Android). Citizens can describe an issue using title, description, location, category, image(s) and video. Citizens can post comments or vote for issues that have been submitted by other citizens. 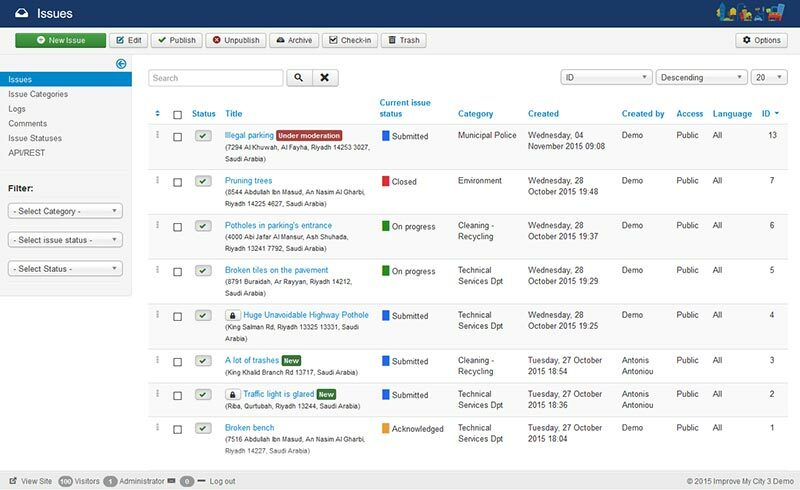 A fully customisable administration system supports the distributed management of issues by different municipality departments. Issues are analysed and visualised using heatmaps, tag-clouds, color codes and pie charts. The application makes it easy for anyone to report a problem or suggest an improvement to the city’s infrastructure. 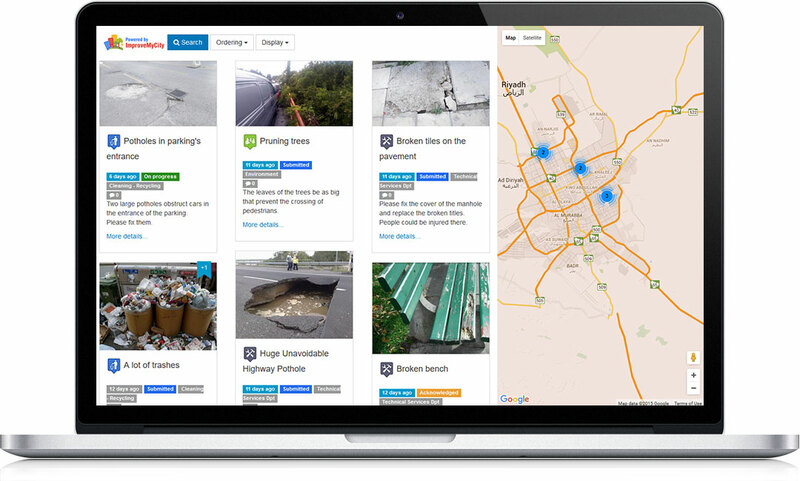 Citizens are able to determine the exact location of their issue on the map and provide more details using text, photos and video. Citizens are informed about the resolution process and can be actively engaged by providing their comments and ratings. The administration effort is splitted across departments as the issues are automatically routed to the responsible officer. The Municipalities can assess the performance of different departments, as well as reveal city areas with dissatisfied citizens. Report issues from their home using the web version, or while on the street using the mobile app (iOS & Android). Use the city’s a map to determining the exact location of their issue. Select one of the pre-specified categories reflecting the municipality departments. Provide only the information necessary to locate and resolve the issue, such as title, description, location and category. Attach an image on the spot for describing the issue. Post comments or vote for issues that have been submitted by other citizens. Reported cases then go directly into the city’s work order queue for resolution, and users are informed how quickly the case will be closed. When a case is resolved the person who has submitted the issue is informed. Presents a list of issues with the essential information and a detailed page per issue with the full set of submitted details. Routes the issues automatically not only to the appropriate department but also to the inbox of the responsible officer. Provide feedback to the citizens giving explanations for each specific case. Monitor the progress and inform citizens by email about the issue’s resolution process. Dynamically explore citizens’ data through interactive visualizations by combining temporal filters with free keyword-based search. Discover hidden patterns by observing spatio-temporal tendencies, unexpected periodicities, significant outliers, popular issues and prevailing terms. Using these tools, Municipalities can identify areas with dissatisfied citizens, under-performing departments due to heavy workload, seasonal burden on city infrastructures, etc.